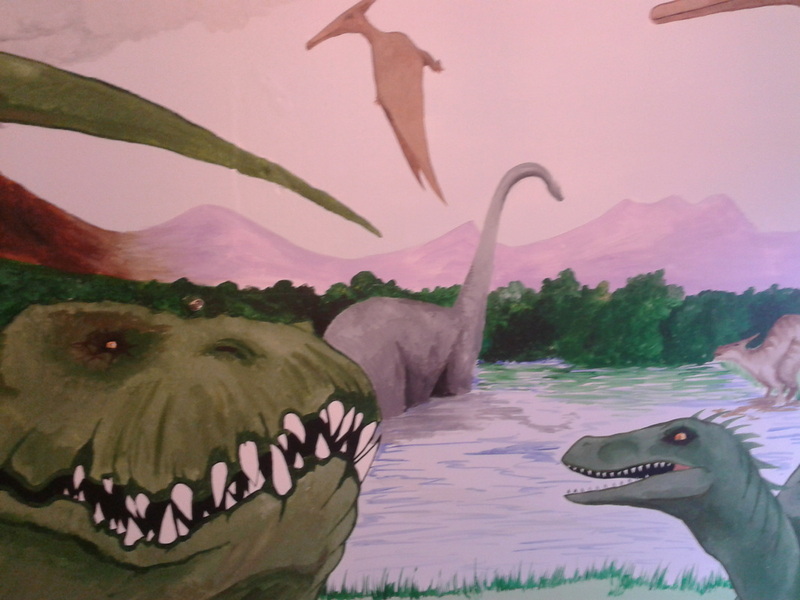 This Hand Painted Dinosaur Wall Mural was done using acrylic paint and took approximately 2 and a half days. I was contacted by the customer and asked to deliver a "real life" Dinosaur theme, and to try and make the Dinosaurs as realistic as possible. Below you will see how the mural came to life from the initial sketches to the finished wall mural. When the brief was given they provided me will Dinosaur wall murals that they had seen, images from a book and a list of Dinosaurs that they would like to see on the wall, tyrannosaurus rex, a raptor, pterodactyl and a brontosaurus. These were all featured along with a couple of edmontosaurus grazing near the water.